1968 - Opinions on '68 Convert Funky VIN? Opinions on '68 Convert Funky VIN? Asked seller and he says door and dash match, even says so in the ebay listing but clearly that is wrong. Door tag looks old and crusty like an original. Dash tag looks sharp and clear but there seems to be a misalignment between the 1 and 6. I assume Ford used some type of gang holder for these rather than individual stamps? Car has been for sale here locally for quite a while, maybe due to this issue. I have not looked at the stamped apron VIN but I will get in image of it and post here. Be very careful. The Dash Tag looks VERY fresh (and you can buy them on E-Bay). The Dash VIN Tag is the ONLY legally accepted verification for all DMV's. If the state DMV suspects fraud, you are left with a non titled vehicle. Plus the fact that the VIN numbers match between the VIN Tag & the Door Tag except the for the engine code designation (J versus C). Not worth taking a chance. 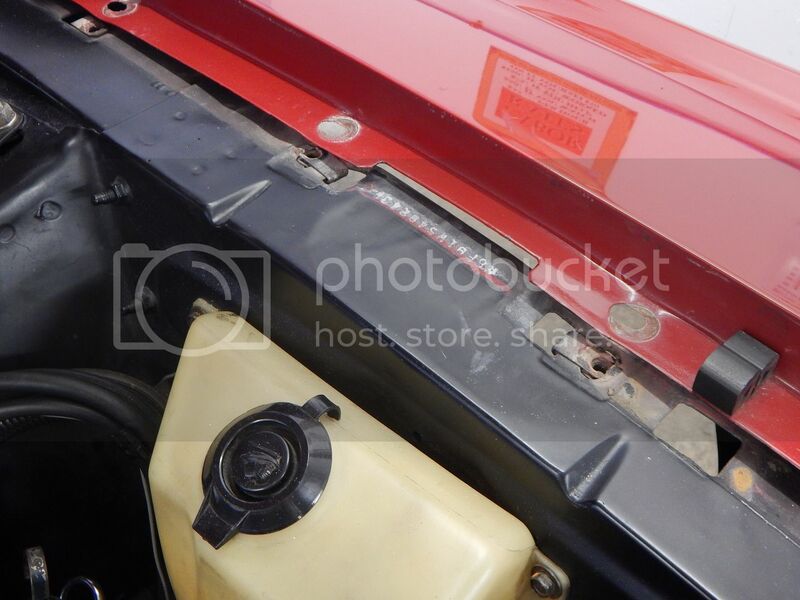 I bought a '68 convertible, and the Dash VIN Tag was missing. Duplicating them is illegal (even though you can buy a blank on E=Bay). It gets worse: the stamped VIN on the front inner fender, Door Tag, and engine were ALL different numbers. I contacted the NCDMV Inspector's office (ALL antique cars must be inspected for VIN verification in North Carolina) to check on my options. The Inspector ran all 3 if the VINs on the car and fortunately all were clear of any theft reports. NCDMV then issued a NC VIN and I got a clear title for the car. All I had to do was COMPLETELY rewire, new interior, fresh engine. PS: Wanna buy a nice driver convertible? Last edited by franklinair; 10/12/2018 at 10:24 AM..
Get the apron VIN numbers. If they do not match, then a problem. If they do then we will go to sheet metal date codes. Something smells a bit fishy here. Buyer beware! At the same time weird stuff did happen. So the jury is still out. Even if the numbers match between the inner fender panel and the VIN Tag, if the DMV inspector suspects a duplicated VIN tag, that equates to Fraud. I'd walk away from this car. As it says on the door tag, it's not for registration. If the dash and apron VINs match I would think you would be good to go as door trim tags were quite often lost or replaced when doors were changed do to accidents or rust repair. On the other hand if the dash and door VINs don't match I would walk away. I've heard horror stories where states have impounded cars when there were VIN issues. You might also for peace of mind ask someone at your local cop shop to run the VIN for wants and warrants. They won't give you any information about the owner but they will let you know if the car is listed as stolen, involved in a crime or was salvaged. Most cops are happy to do it as it's an easy way to find stolen cars without much work on their part. I think the problem is the replacement VIN tag on the dash. Someone could have replaced an original tag with this one and there is no way to know if they match. Leave the old tag in place no matter how grungy it may be, or photo document removing it and keep the old one. The door tag can be somewhat verified by looking at the car. Color under the sill plate that matches the color code. The axel and trans code matching. The real way is to get the hidden vins and look for panel replacement of the aprons they are stamped on. and then finally looking at as many of the sheetmetal date codes that you can find. If they are before the build date on the tag and are dates a month or so before, you start to solve the puzzle. I do not think the fact that the dash vin is new looking will be an inspection problem in our state. What really does it is mismatched vin numbers on the car. This car reeks of being an original survivor. My guess is the vins will all match. But it sure better be cheap, it looks like a lot of rust repair!! "on 68 not all of them had fender stamps only the early 68's"
I'm not well versed enough in 1968's to know if this is correct? 1.) VIN Tag is a repro. Do the math. You'd have $35K in a $25K suspect vehicle. It is under the fender, not in the notch. Arlie is spot on. The owner can see them from the bottom with front tires off. It will be upside down and difficult to read. He will need to take a wire brush to clean the area up Or better he can pull the fender back and see them. From the data available today it should have a stamp on each apron in front of the shock tower. None in the notch as Arlie states. Here is where they are. The left fender is the easiest. It is not in the notch but just under near the notch. This is a 1968 cougar, but it is same same. I completely agree. Even without the VIN issue that is a rough looking car.